Butterflies: These little butterflies ( approx. 2.5" X 4.0") on six inch brass rods , of original design, are leaded in the Tiffany copper-foil method. 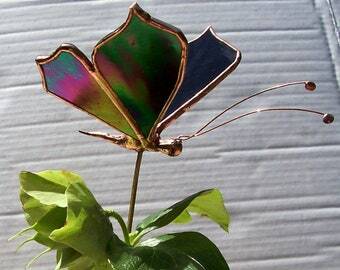 They include lead bodies and copper antennae, and would look lovely grouped among your plants, bringing spring inside year-round. There is a Native American legend that says, "If you have a secret wish, capture a butterfly and whisper your wish to it. Since butterflies cannot speak, your secret is ever safe in their keeping. Release the butterfly, and it will carry your wish to the Great Spirit. 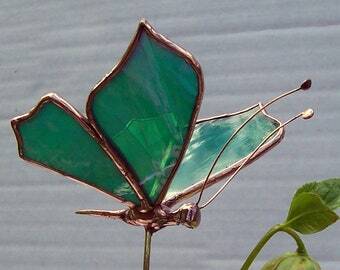 By setting the butterfly free, you are helping to restore the balance of nature, and your wish will surely be granted." 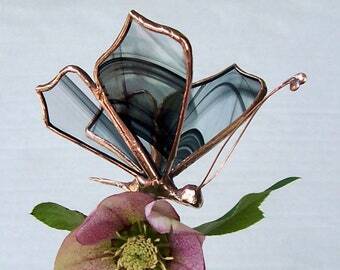 The butterfly is a reminder to make changes when the opportunity arises. 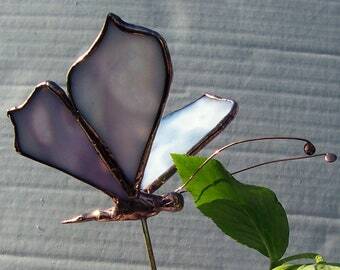 Butterfly symbolism is also closely tied to the idea of spirits and souls. It has been used in many religions and cultures. In the western world, the symbol of the butterfly stands for freedom, fun and joyous times. It is also symbolizes a state of naturalness and purity. 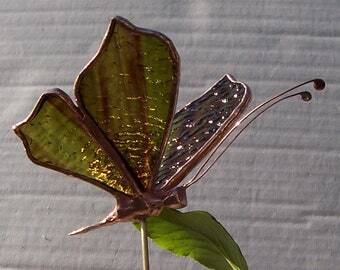 In the Japanese culture butterflies are thought to be representative of young maidens and marital bliss. Many Japanese families use the butterfly in the family crest. 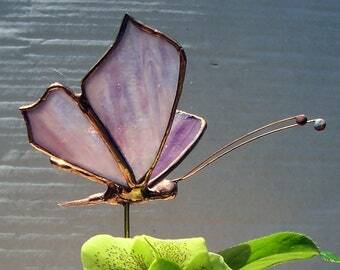 In ancient Greek and Russian the word for butterfly is "Psyche", which translated means "soul". 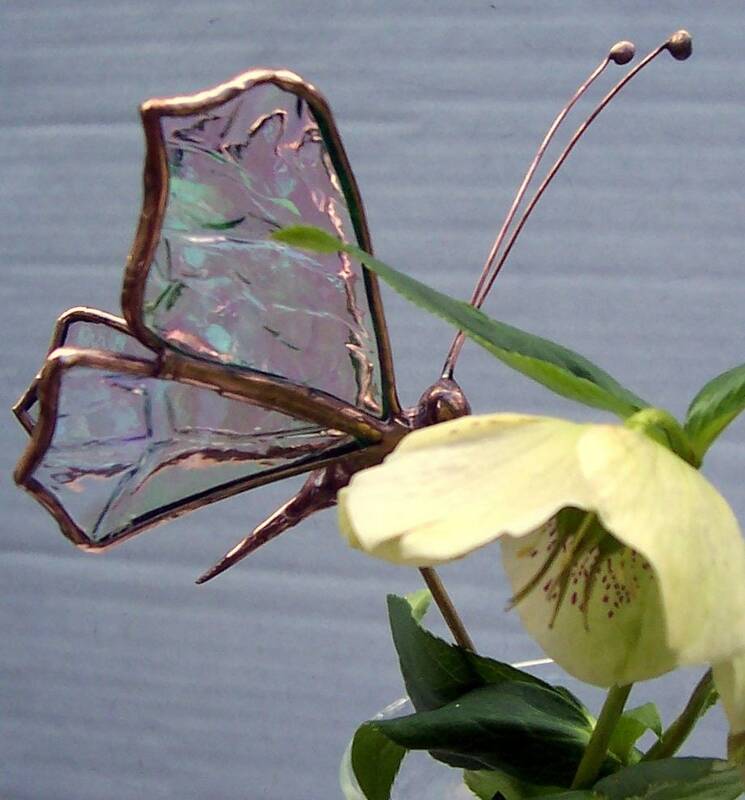 There is also an Irish saying that refers to the symbolic meaning of butterflies. This saying is: "Butterflies are souls of the dead waiting to pass through purgatory" Butterflies also symbolize: Resurrection, Transition, Celebration, and Lightness. 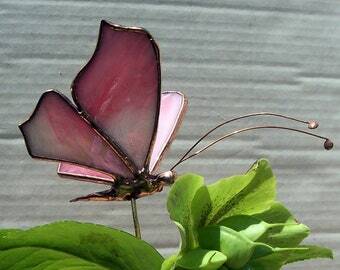 There is a small town in Mexico that also associate butterflies with souls. It is to this town that Monarch Butterflies migrate every year, around the holiday known as the Day of the Dead. The people of this town see these butterflies as the returning souls of the deceased. The most common feng shui use of the butterfly symbol is as a feng shui cure for love and romance, because love is the most transformative feeling that makes you feel like flying. Born in the unlikeliest places….